After a recent visit to a fire-safety Exhibition in Manchester where the headline theme read ‘ Change Attitudes, Be Heard, Save Lives.’ A lot of the major UK companies were represented and the latest probabilistic scenarios were put forward to reveal fire industry innovative products of tomorrow. As a lay person I was really overwhelmed and taken in by all the sights and sounds of the fire safety industry within 21st century. It really was reassuring to see technology being pushed to the fore! We believe there is a gap, an element in fire safety emergency evacuation that has been overlooked. A gap in terms of Fire safety equipment that deals with BS Toughened safety Glass and the ability to identify obstructions in an entrapment emergency situation. From the turn of the century Architects have been instrumental in how we live, to where we work, in forming buildings we now come to know as cities. Because of its cost and durability, glass became an industrial workhorse and impacted into society, helping to accommodate generations across the globe. In 1973 as Britain began to freeze under restrictions placed by an Arab oil embargo, Parliament moved swiftly to address the need for fuel efficiency. As part of the new ‘Regulatory Building Regulations’, Britain would embrace a new dawn of energy efficiency and ways of preserving heat, double glazing. Why is Glass so Tough? A new tougher more robust toughened glass was introduced ‘Safety Glass’ and endorsed under UK Building Regulations in areas where there is a high risk of collision,such as a person running or colliding with a glazed door/window. These would later be identified under BS6206 – BSEN12600 as ‘Critical Locations’. In accordance with BS EN 12600:2002 impact testing is carried out on glass samples measuring 876mm x 1938mm where an impactor weighing 50kg is released from a pendulum mechanism at 3 different heights; Class 3 has a drop height of 190mm,class 2 has a drop height of of 450mm, class 1 has a drop height of 1200mm. These impact results would form the toughened safety glass as we recognise to day as catergories class (1) class (2) and (3). Depending on how large or small the area being covered by glass and its location would determine the classification/thickness of the toughened safety glass put in place ie:The standard defines three drop heights: 190mm, 450mm, 1200mm. the glass is classified at the point in which it breaks. All modern windows come with double glazing, which means that there are at least two obstacles to overcome in order to break the glass. First, there are the two panes of glass. If you throw something (a brick or a stone, for example) at a double glazed window, it’s very likely you break only the first pane and the second one remains intact. Second, the sandwich of air between the two sheets of glass acts as a shock absorber, making it very difficult or impossible to break a double glazed pane by hitting it in the middle. Alternatively it could be commercial environment and be fitted with different thickness’s of BS toughened glass depending on location. My name is Christopher B Carr a retired aircraft engineer. Some 40 years ago my wife witnessed an elderly man perish in a Council house fire. Despite heavy objects being thrown at the toughened glazed window by surrounding neighbours and the man himself, nothing could penetrate and break the toughened glazed window. The elderly man perished.I have always been mindful of events that unfolded that day and kept a close eye on the fire safety industry as it unfolded into the 21st century. I do not believe anything has changed significantly or adequately in 40 years that addresses the position of entrapment by or BS Toughened glass in an emergency situation. Through 8 Years of design and meticulous testing SAFE STEP the BS toughened Glass enforcer was built and designed to confront the issue of entrapment by BS Toughened glass.SAFE STEP will revolutionise the fire safety aspect of home/workplace over night making the environment to which you live/work a safer place to be! We are pleased to announce POWER PUNCH the tungsten carbide tipped glass enforcer that can smash through any toughened BS glazed unit endorsed by UK Building regulations.POWERPUNCH will over come the obstacle of toughened safety glass by giving you valuable seconds in what could be the difference between life or death! 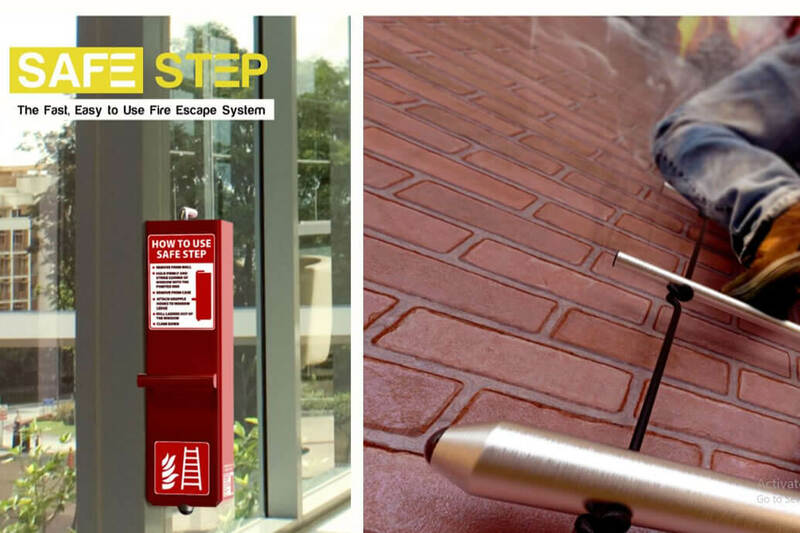 This ‘compact pocket rocket’ that packs a big punch also comes with a quick release light weight emergency escape ladder.By incorporating the emergency escape ladder into the SAFE STEP model we are convinced that we have designed a piece of fire escape apparatus, that is essential to any environment, where a persons safety may be compromised by BS toughened Glass. Now registered with the IPO and protected by the companies intellecutual attorney, SAFE STEP has recently been nominated by SGUK Health & Safety Innovation Idea Award 2018/19. Next time you happen to travel on any form of public transport, please just take a minute to look over the emergency procedure, within the carriage and you should immediately be aware of signage to all exit points and a flagged up area highlighting a piece of apparatus that will smash through BS toughened safety glass . This is legislation on all UK public transport! UK GOV Public transport has flagged up and identified toughened BS glass as a potential obstacle within an emergency escape scenario and correctly prepaired and legislated for it. Two areas of our lives where we spend most of our day, our workplace and our home does not? Glass in the industrial world is simply something we cannot live without or ignore.With so many factors and risks involved, it is essential we identify all risks and foresee each consequence and visualise all potential outcomes. It is vital we take responsibility for ourselves and our families!